Sundae everyone feels it is Ice cream but it is a Breakfast Sundae – it’s a dairy free, nutritious breakfast sundae that’s just as delicious. This treat contains Pineapple whip, berries, fruits and homemade Granola. As a variation I used Pineapple whip in place of Yogurts and Homemade Granola with Red rice flakes and Oats. Eat this sundae and you’ll be starting your day off with lean protein and good fats, which is prized in both Japan and South America for its health-benefits. Combine pineapple chunks, vanilla essence, maple syrup in a blender/food processor and blend until smooth. Combine all fruits in a bowl mix well. 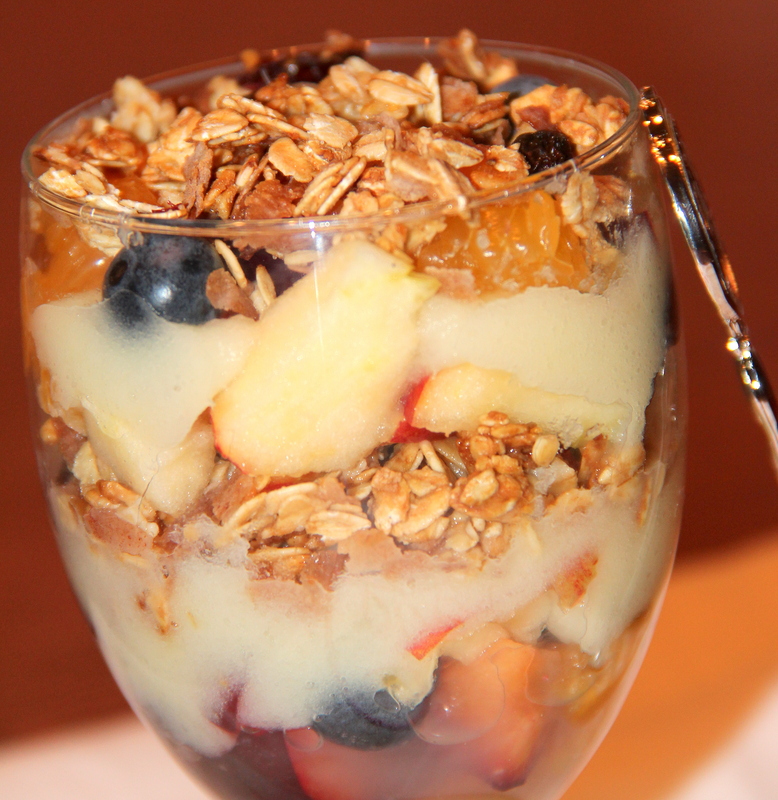 In a sundae glasses, layer first with fruits, then pineapple whip, and granola alternately until the glass is filled. Posted on August 30, 2014, in Breakfast, Dessert, International, Vegan and tagged Chitras healthy kitchen, drchdietfood, Healthy Breakfast ideas, Healthy breakfast recipes, Vegan breakfast recipes, Vegan recipes. Bookmark the permalink. 32 Comments. Yum! I would love this for breakfast or any time of day really. Thank you Chitra, I’m excited to try the Pineapple whip Sundae! It so great to discover fresh vegan recipes that are healthy and delicious. Enjoy your day! 🙂 a smile a day keeps the heart pounding with warmth. Looks like I really need to research proper high-speed blenders. Both your recipes at the VVLP look so tempting and creamy smooth, yum! Thanx a bunch for your lovely words and glad that you liked it… have a fab weekend. .